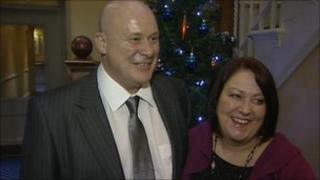 A self-employed tiler who was down to his last few pounds has won £2.4m on the national lottery. Neil Jones, 47, of Stoke-on-Trent, spent £3 on the lottery tickets for last Wednesday's draw. After realising he had won, he kept the wining ticket under a carpet as he was so nervous of losing it. He said it had been a difficult few months for him as he was self-employed. He was planning to spend part of the money on a "bumper Christmas". Mr Jones, of Fenton, said the win had made him anxious. He said his partner, Julie Kirkham, 43, had thought he was pulling her leg. "After we called Camelot, I kept the ticket in my wallet, but I was nervous that I might lose it, so I put it in an envelope, inside a Christmas card, under the carpet in the house for safe keeping," he said. "I wanted to check it was still there but I was worried that if I kept unfolding and folding the ticket, you might not be able to read then umbers any more." As well as a special Christmas, the couple plan to spend their winnings on a new house, a holiday to Egypt, a new business and a second hand car. Ms Kirkham said: "I still can't believe it. "My head is in bits and I can't think straight." Mr Jones said he had read about people who were down to their last few pounds when their luck turned. "Just as it was confirmed we had definitely won, I got a phone call on my mobile to ask me if I could tile two bathrooms before the end of the year. "Our luck has definitely changed for the better." The lucky dip ticket, bought from Bargain Booze, in Fenton, had the winning numbers 14, 16, 23, 24, 25 and 43.